The California D-I-Y winery Crushpad takes its concept to Bordeaux. In 2004, Crushpad started in San Francisco with a fully equipped winery where wine hobbyists and starting winemakers could make their own wines. Those interested can choose how far they are involved in making their own wine. They can pick the grapes themselves, be involved in pressing the wines, etc., but it is also possible to make “their” wine entirely via the Internet. A barrel of D-I-Y wine costs about $ 12,000 and provides 25 cases of wine or 300 bottles of 750 ml. Groups of hobbyists usually work together and share the costs of making their own wine. The French-American businessman Stephen Bolger brings this concept to Bordeaux, reports ABC News. The European branch of Crushpad is located in Chateau Teyssier and has nine vineyards on the left and right banks of the Gironde river that cuts the Bordeaux wine region in two. Clients can select their own grapes and then follow the vinification via the Internet. The cost for a barrel range from € 6.600 to € 8.400 plus VAT and transport. This amounts to approximately € 22 to € 28 per bottle, excluding VAT and transport. You can pay at once and get a 5% discount, or you can pay it in three parts: one third after the reservation, one third in October when you begin to make your wine, and one third in January of the year that follows. 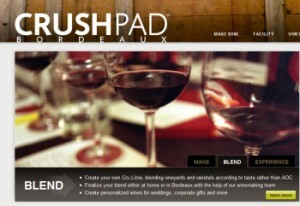 All details are available on the website of Crushpad Bordeaux.